What Are the Benefits of a Oatmeal Face Mask? Oatmeal contains 18 different amino acids, which are essential to healthy skin. Amino acids act as building blocks for the body, helping to rebuild tissue and promote healing. Your face can absorb amino acids from the oatmeal in a face mask, making it an ideal ingredient to help heal blemishes and repair damaged skin. Oatmeal has skin-soothing properties and it is hypoallergenic. When combined with other products, those with sensitive skin or allergies can enjoy the benefits of an oatmeal face mask. These characteristics can also help alleviate rashes and allergic reactions, as well as sunburn and other skin damage. 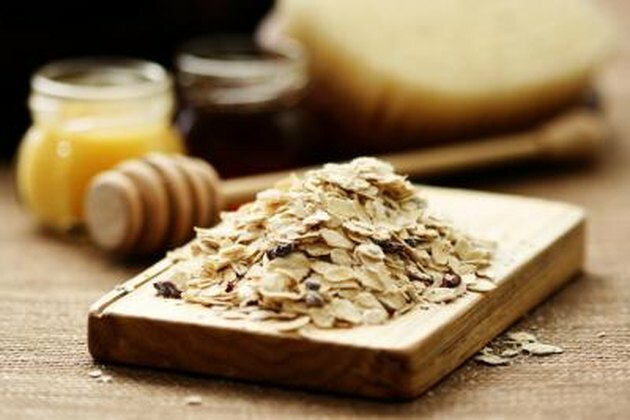 While oatmeal alone does not moisturize your skin, it is a beneficial component in a moisturizing face mask. Oatmeal is a humectant, which means that it helps your skin retain moisture. When used in conjunction with skin-hydrating ingredients, oatmeal can help your skin take on a glowing, dewy appearance. The course, granular texture of oatmeal makes it an effective exfoliant. Exfoliation sloughs away dry, dead skin cells to make way for fresh, healthy ones. When used regularly, the combination of exfoliating, new skin growth encouraged by the amino acids and the extra moisture provided by the ingredients in an oatmeal face mask promote vibrant, younger-looking skin. What Are the Benefits of Glycolic Acid Toner?